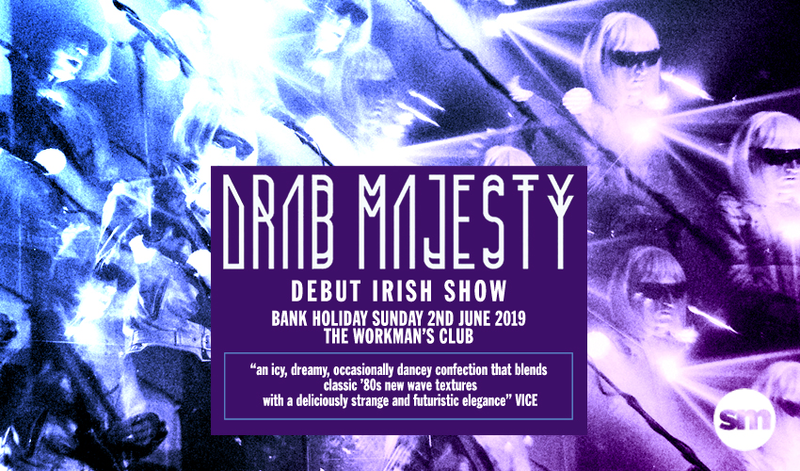 Los Angeles gothic electro heroes Drab Majesty have announced their first ever Irish show at Workman’s Club on Bank Holiday Sunday 2 June 2019, ahead of the imminent release of their third album. Having spent late 2018 supporting Smashing Pumpkins on their US Tour, having been personally invited to support the band by Billy Corgan, their late night show in Workman’s Club will follow Drab Majesty playing one of the world's best-known music festivals Primavera Sound. With the band expected on stage at 12.30am, Drab Majesty will keep you dancing all night long - and is a show is not to be missed! Tickets €15 plus booking fee go on sale Friday 5th April at 9am from Selective Memory (www.selectivememory.ie) and Ticketbooth (www.ticketbooth.eu). Tickets for Drab Majesty live at Workman’s Club on Bank Holiday Sunday 2 June 2019 are priced at €15 plus booking fee (additional charges may apply) and go on sale Friday 5th April at 9am from Selective Memory (www.selectivememory.ie) and Ticketbooth (www.ticketbooth.eu).